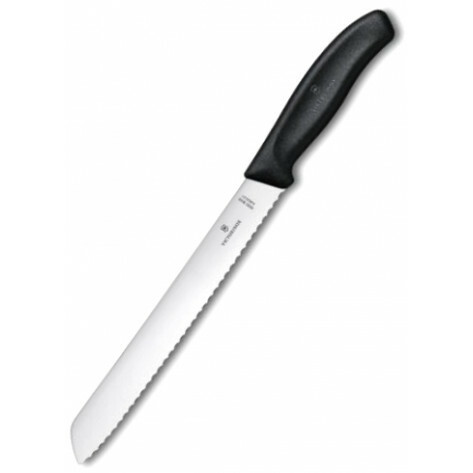 The Victorinox Swiss Classic Serrated Bread Knife is a bread knife with a serrated edge and ergonomic handle. 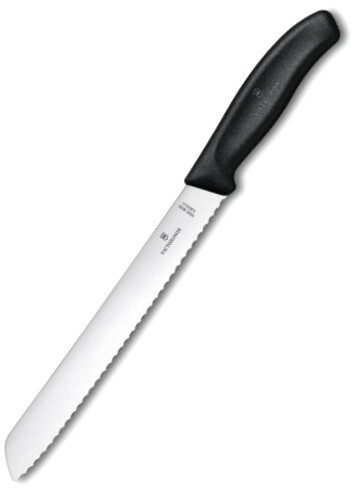 How important is a good bread knife? Here's a better question: How many loaves of bread will you slice in your lifetime? Chances are, it's a pretty high number - so make each one count with the Bread Knife. Its wavy edge and ergonomic handle guarantee smooth operation and precision every time. And its strong blade holds its edge so you can slice on and on and on. The Swiss Classic Range of household knives and utensils, feature Victorinox's latest ergonomic injection moulded nylon dishwasher safe handles, which rest comfortably in the hand and are an essential for every household. Featuring High-Carbon Stainless Steel blades, which hold exceptionally good edges and can be easily resharpened.